I stopped by an Apple Store nearby, and played with the new iPhone 7 for a couple of minutes. Why? I have an iPhone 5s which is still working, but it is lacking some nice-to-have features. I got the 5s back in the day because I got fed up with my Galaxy Nexus—it got unusably slow, and I wasn’t really a fan of the screen size (it was too big). That’s right, I wanted a phone screen that was smaller so I could use it with just one hand. The iPhone 5s fit the bill perfectly. My main goal with playing with the phone at the store was to see if I was OK with the size. I made sure to type on the keyboard both one-handed and two-handed, browse some websites (mostly scrolling around), and see which screen locations were hard to reach. The new home button is certainly interesting. It is a fingerprint reader (this is nothing new by itself) with haptic feedback. So, “pressing” it results in a similar sensation to what the physical button provided in the previous models. It’s not the same exact feel, but it was surprisingly good. It felt like the feedback was coming from near the home button, not just the whole phone vibrating. The phone certainly felt bigger than my current one. The test drive wasn’t long enough for me to make a determination based on this alone. While playing with the phone, I made an interesting “discovery” about my one-handed use of phones. Apparently, I hold smartphones one of two ways. If I am typing, I hold the phone further down; on the other hand, if I am mostly scrolling, I hold it closer to its center of gravity. Needless to say, this affects how far on the screen my thumb can reach. When I’m holding the phone near the center of gravity, all icons (see above screenshot) except the top row and the Maps app are easy to reach. The Mail app is essentially impossible to reach without shifting the phone in my hand. The remaining ones are doable, but it takes more effort than just moving my thumb over. If I’m holding the phone lower down (e.g., because I was just typing), then the top two rows of icons are hard to use—with the top left corner (i.e., Mail) being impossible to reach. 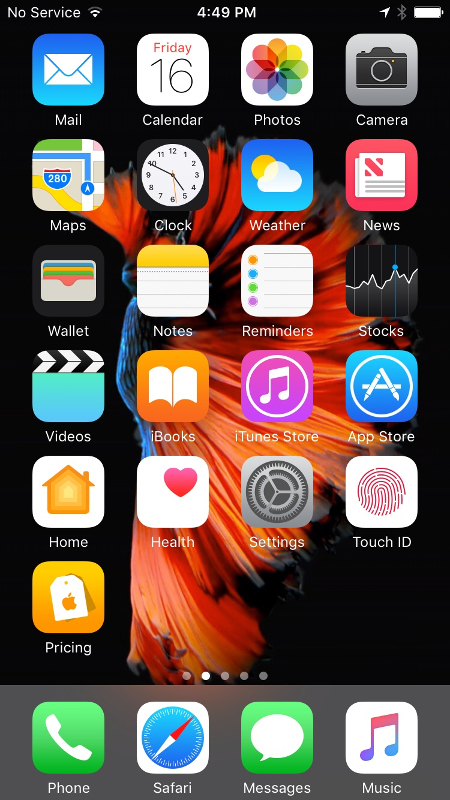 There is an accessibility option (called “Reachability”) which shifts the whole screen down 30–40%. This makes the top two rows of icons reachable. (Once enabled, trigger it by double-tapping the home button.) While it is neat that this is available, it feels a bit like a hack. When I got home, I decided to make a table of the physical specs. Specifically, the physical dimensions, weight, and the screen size. In addition to the two iPhones, I included the Galaxy Nexus (my previous phone) and the Samsung Galaxy S7 (the current flagship Samsung Galaxy phone). When I first made this table, I was surprised at how close the iPhone 7 is to the Galaxy Nexus. Size-wise within a couple of mm! Weight-wise only a 3 g difference. The good news is, I can use my 2.5 years of Galaxy Nexus use as a guide to answer my question about the iPhone size. The bad news is, I didn’t really like the screen size on the Galaxy Nexus. I think the conclusion is clear—I am going to wait to see if Apple makes a smaller version over the next year. Until then, I will stick with my 5s. Anyway, the whole thing felt like an Armageddon rip-off. All in all, I don’t think Flight of the Phoenix is worth watching.